GDPR: I’m NOT an expert, and here’s a warning! 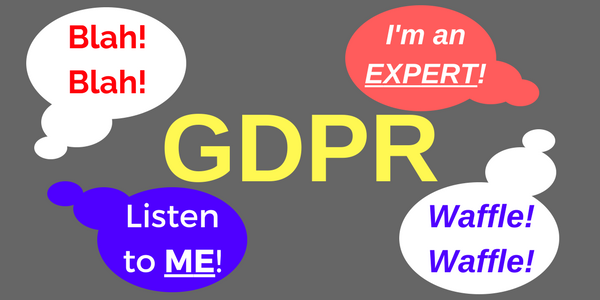 Posted on 20th November 2017 by AdrianM in #GlosBiz, Blog, Business, Development, Executive coaching, Growth management, Knowledge, Leadership, Local business, Management, Mentoring, Strategy | Comments Off on GDPR: I’m NOT an expert, and here’s a warning! Firstly, let me make this absolutely clear – I am NOT a GDPR expert by any stretch of even the wildest of imaginations! No doubt you will be aware that the EU’s General Data Protection Regulation (‘GDPR’) legal framework, for handling data, will apply in the UK from Friday 25 May, 2018? I am sure you will also have noticed the glut of self-professed GDPR ‘experts’ that seem to be just about everywhere at the moment? These ‘experts’ are creating reams of GDPR ‘newsletters’, ‘fact sheets’, ‘presentations’, ‘talks’, and all manner of ways of distributing their views. But, be warned! Choose your sources with immense care! On behalf of clients, I have spent the last couple of months carefully looking for the most accurate and easily understood sources of information and guidance on GDPR. The outcome of this review? With the aid of some legal guidance, I reviewed over 20 of these ‘experts’’ ‘newsletters’, ‘fact sheets’, and ‘presentations’. The results are ever-so-slightly alarming! The Information Commissioner’s Office, the UK’s independent authority on information rights, which is easily found online at https://ico.org.uk/, and where there is a considerable amount of easy-to-understand information, guidance, and details about how to understand GDPR, and how to implement it in your business. This is completely FREE! The only other source of information that I would consider accurate is through a solicitor with the relevant specialisation you require (e.g. : commercial, property, employment, etc). This probably will not be free, but you will be getting GDPR information that is absolutely relevant to your specific enquiry.